It might be best to read that story first. I need to have a fence that will hold goats. I have a childhood friend that I recently became reacquainted with through facebook. He is a farmer back in Kansas and says that to hold goats a fence must first be able to hold water. I dunno. Pretty lofty standards. The llama, if indeed he becomes the pasture guard for these little guys, already prefers to be inside the fence. I think it represents his security blanket and I'm very thankful for that. He would be sold if he constantly escaped because he is a real challenge to pen up again. 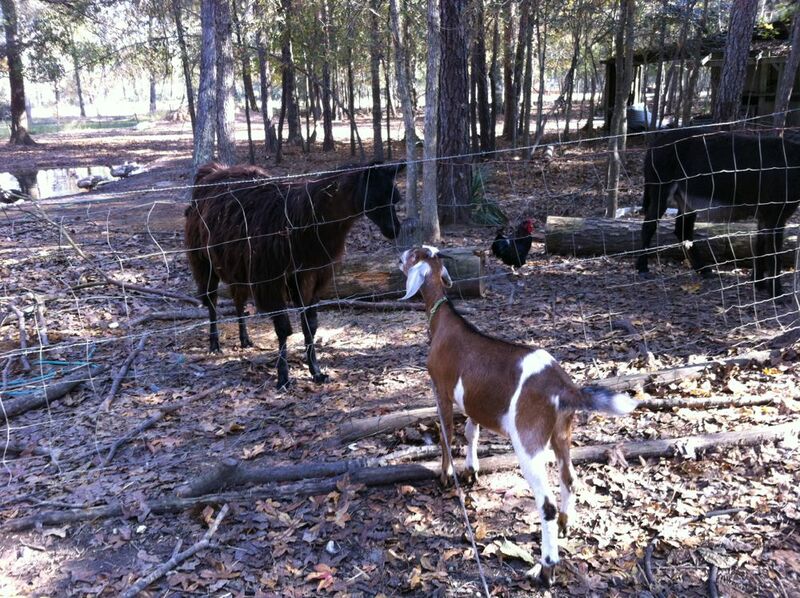 The goats don’t have lofty ambitions but the grass is always greener and the fences may be invisible to them. What we have going for us is that they associate me with food and a scratching/petting session. This fence has been up for years. If you followed the link you have seen the other side embedded with taillight lens. It’s donkey proof and llama proof. The small stick at the top was added the year we got the llamas. It holds the barbed wire. The llamas beat me mercilessly until I added that. Probably not needed now. Just one llama and he's happy (I think). By the way, since I don't mention it elsewhere, the pipe is a storyboard. It is 8' long and marked every foot. It was made for installing fence posts. Goal: 8' from center hole to center hole. The crossed string gives line that I used as a guide. I was just going to repair the gate as the fence was a pretty functional structure. Then Sally hit me with a point that I couldn't dispute. When one does a repair it's ok to try to make it look good. Oh. Ok. I'm trying. This line is where the new fence is going. The setback will reduce the chances of another wild driver by a little bit. Using three trees as posts makes the chances of survival even better. None of these strange individuals have yet hit the trees. Turns out a post that had a glancing encounter with a car was repurposed. 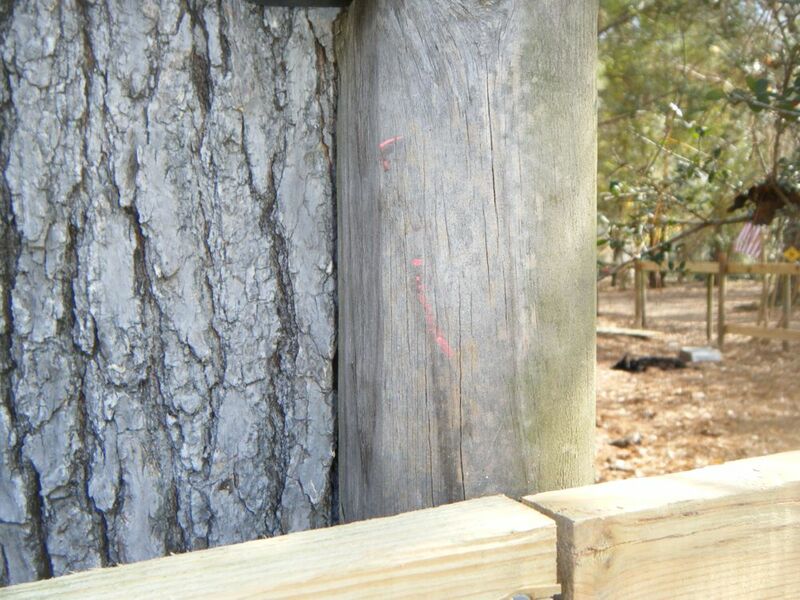 The red marks on the post are from a neighborhood squirrel armed with a motor vehicle. This one is attached to the tree with a long lag bolt because I needed a straight vertical attachment for the fence boards. That straight attachment is shown better in this picture. It also helped work as a spacer and made for a fairly straight line. I felt lucky that the trees were that close to where they needed to be. I built this so my culvert had a chance to survive. It may have the added benefit of slowing a car down. Then the distance and ditch will be far more effective. Even my heavy steel mailbox stands no chance against a car. 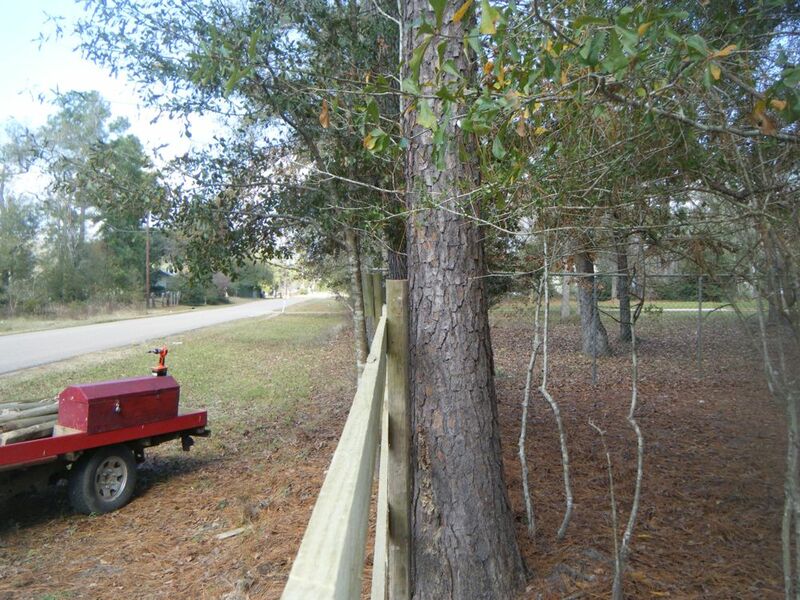 I moved the fence back some along the driveway as well but for a totally different reason. When I installed that fence the crape myrtles were smaller and I just followed the natural curve of the drive. 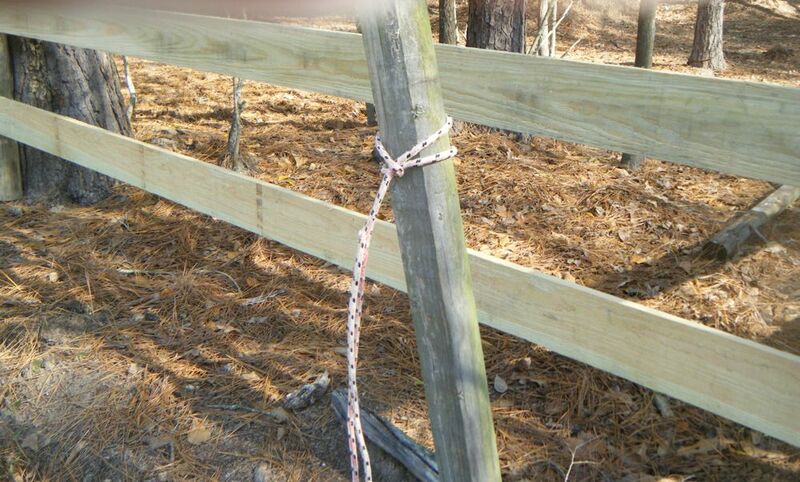 That makes for a crooked fence and this string helps remedy that. Todays landscape timbers don’t seem to last more than six years. I have taken to using T posts when possible but for this (fancy) fence I thought I needed genuine treated wooden fence posts. These are four inch diameter by six and a half foot long dedicated posts. The cost is more than twice that of a landscape timber. 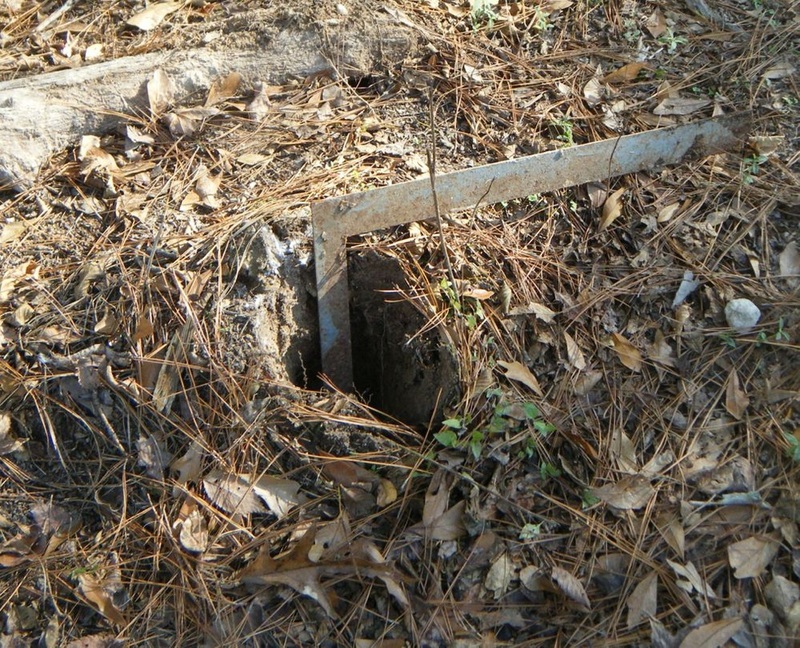 The ground is hard along the drive and the footing for the post is concrete. It is elevated compared to the ground around it. We will see. I hope they last twice as long. This is what you need for concreting the posts. I have found this little fireplace shovel to be very handy when doing all manner of concrete work. It is particularly handy as a small shovel. Go figure. 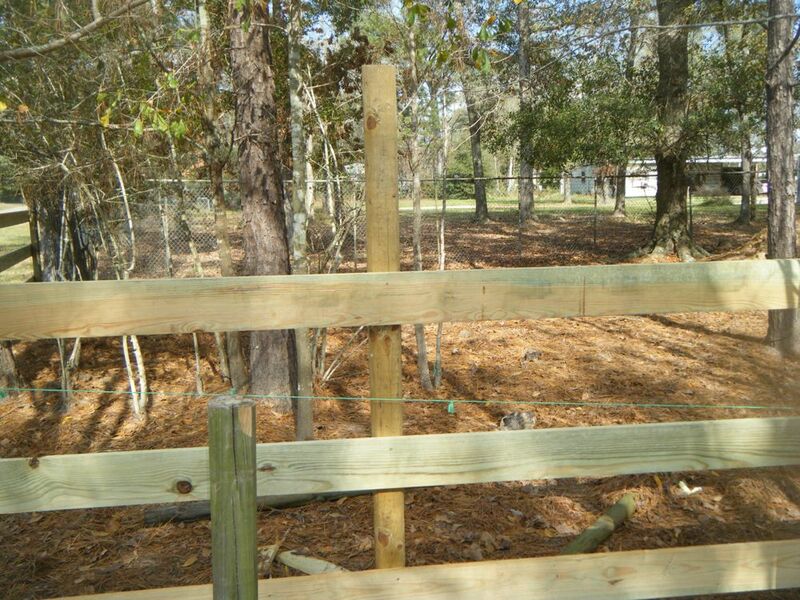 You could probably ask yourself how one person could build a fence like this by himself without getting all sorts of crooked boards. After all, I'm on record as thinking squares and plumb bobs are for sissies. The first step is the string shown above. Additionally Sally introduced me to this gadget (the little red thing). It’s called a level (an added little name that might appeal to my fellow submariners, it's a torpedo level) and works on the principal that bubbles will float uphill in a liquid. Yeah. I know.... but she insisted that I use it. 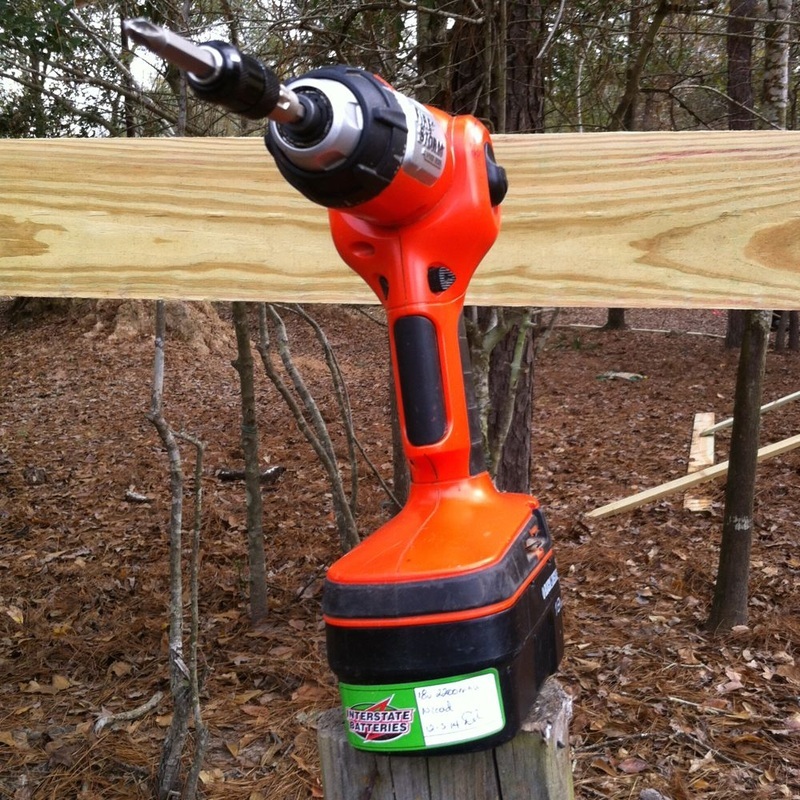 Put a screw in the fence post where you want the bottom of the board to be. 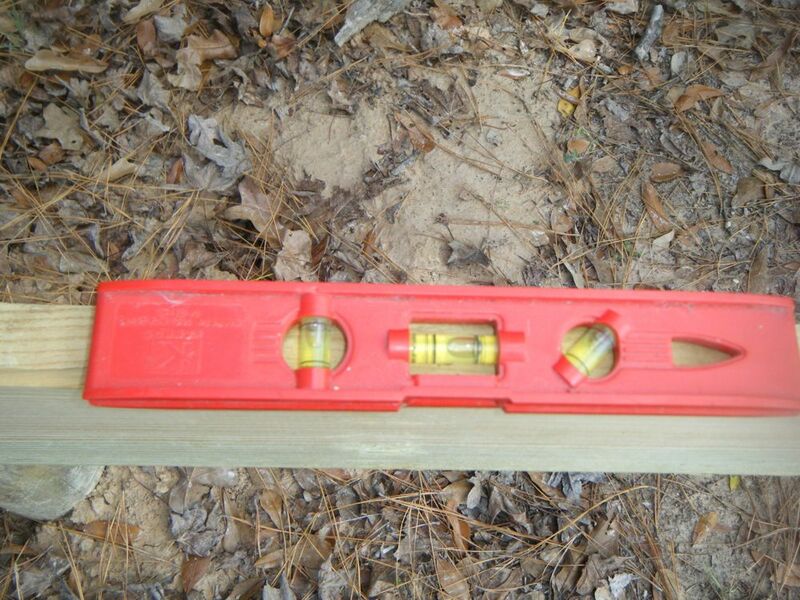 Then rest one end of the board on that screw and move the other end up and down till it's level. The level doesn’t seem to care which end of the board it’s on. When the bubble centers screw it in place. This board is not installed crookedly. It is not installed. One end is resting on said screw, the other on the ground. It is now ready to be leveled and installed. I know the concept of the floating bubbles may be as big a challenge for you as it was for me. In this case a picture is worth a bunch of words. It is almost level here. I was holding it with one hand and taking the picture with the other. I leveled it before I attached it. Actually, by this point I was becoming an old hand. This board is using the center bubble but I also leveled the posts before I cemented them. That used the bubble seen here on the left. I know, it's magic and I feel guilty about using it but the possibilities seem to be endless. The idea was to put a post every eight feet but those trees were slightly off. That meant buying some boards that were just barely too long and cutting. It’s a long way back to the house for the chop saw and the boards are heavy. 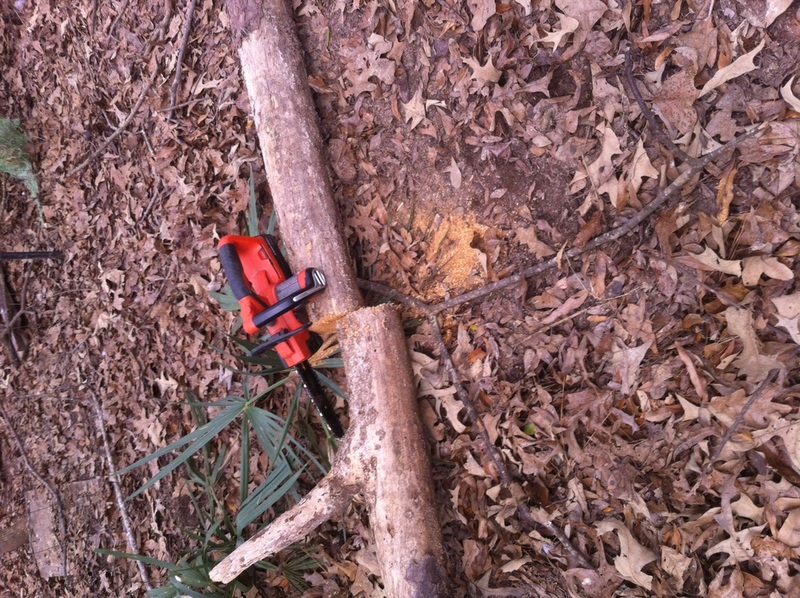 This 18 volt Black and Decker chain saw fit the bill very well. The battery I got with the chain saw has already gone south and I don’t think it’s more than six months old. It works but overnight it will drain down. Might know I would pick the shot that shows my cut off the mark. Sally pointed out that any picture I might have chosen would probably be off the mark. I'm sure she realized the difficulty in sawing with one hand and was trying to make me feel better. You thought this was going to be an advertisement for Black and Decker. Well, in a way it is. They seem to have quit making the 18v firestorm stuff. Factory batteries are cheap but think they may have been on the shelf for a while. Good tools don't work well if the batteries are "also ran". Just before I got serious with this project I went to Interstate Battery. I asked them if they had new guts for my batteries and the man told me he did. Then he said he would build them stronger than B&D. When I brought the old batteries in he showed me the difference. For the past couple days the batteries have been proving it. I have flogged them like rented mules. They have laughed at me. I know this isn't green oak but I still think it's impressive. Gas chain saws seem to delight in failing to start for me and now I have a hard time with the pull rope. This thing just runs till the batteries run down. I have three batteries that I cycle between the saw and the charger when I'm outside. If I need more than that I'll figure something out. I know it isn't supposed to be the thing but I just use a can of WD40 for the chain. It's working great and stays clean. I think new chains will turn out to be cheap. Do not borrow trouble from tomorrow. It’s a bit hard to see with the old fence still up but this is how the front part turned out. The old fence makes the new fence look crooked. I'll work on that Monday. The crooked poles in the center background are at the 8 foot mark of a 16 foot span. It works out well if you install them after the board is up. Makes a straighter run. Screwed into place and concrete added to help keep it there. Looks better now. 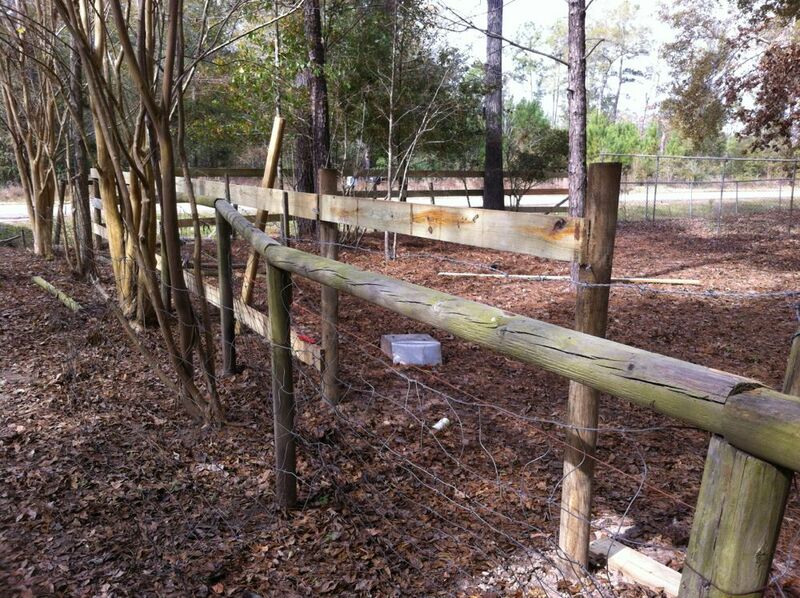 Just have to trim the top of the post before I add the top barbed wire and the weatherproofing. That's another job for the saw and I think I will use brown paint to weatherproof the top of the posts. 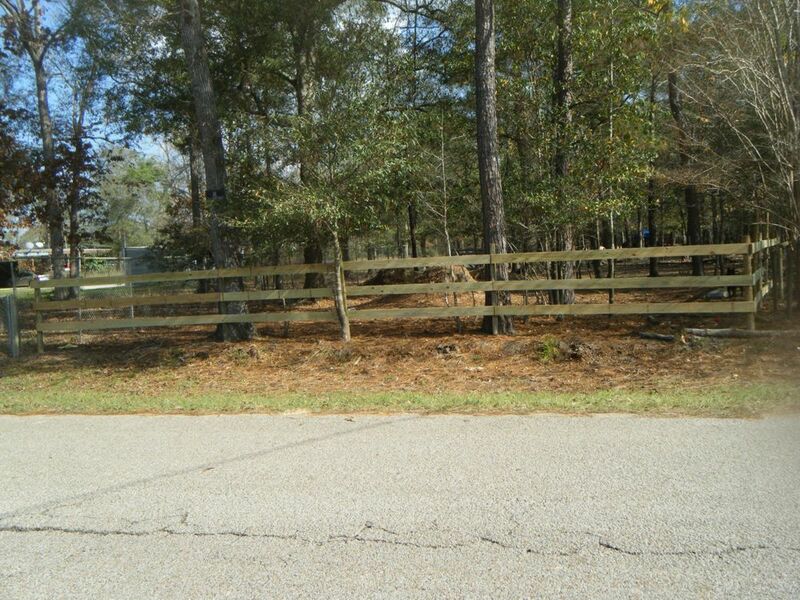 A person could give himself a serious case of fatigue pulling these fence posts. It rained last night which couldn’t have hurt but I still wasn’t going to do it myself. The rope was old and used many times. That means cheap. Caveat here. I once pulled a fence post with a truck and found that what I heard about lines snapping like rubber bands when the post came loose was true. The flying post put a dent in the back of my truck and since then I have been careful. 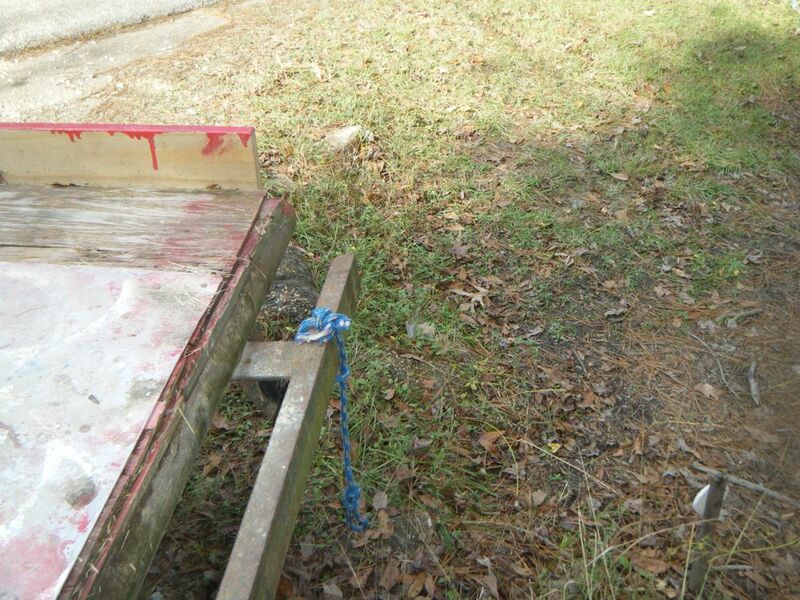 That is why the trailer is always on the back or I'm using a heavy chain when I do this. Also, it gives me somewhere to throw the post when it’s out of the ground. I would say that pulling posts from holes this deep is not an insignificant task. It was rendered more difficult last year when erosion control forced me to add concrete to some holes. This was the first one I pulled today and you can see the results below. This rope is a little bit newer (not much) and it pulled all the posts. Probably doubling the thickness had something to do with that. This barbed wire is about six inches off the ground. Perhaps less. 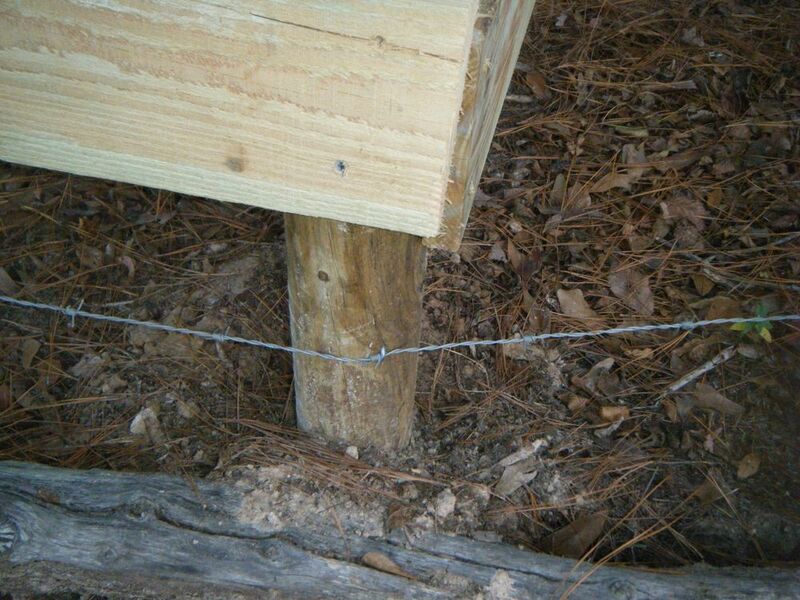 There will be a strand on the top of the post and between each fence board. 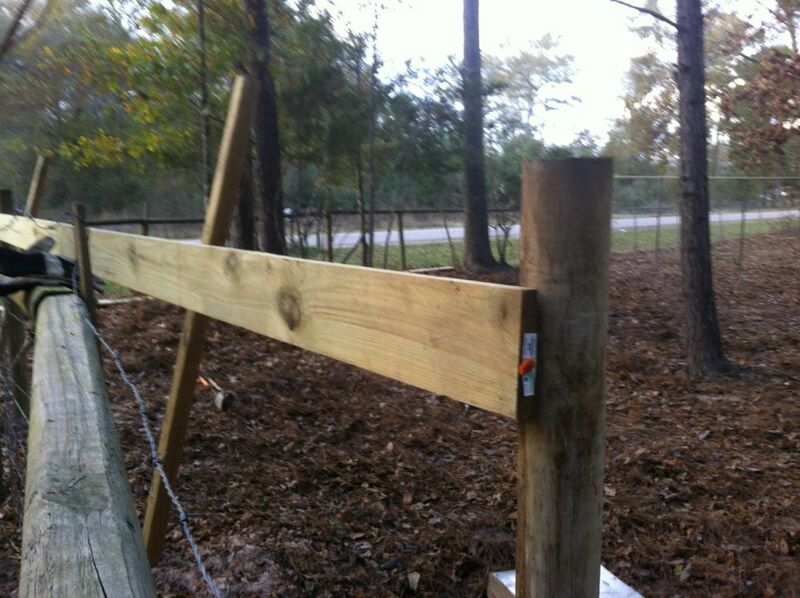 Then I intend to attach the range fence. Won't hold water. Hope it will hold goats. To those who might consider barbed wire inhumane, I think you undersell the intelligence of animals. Our first donkey got cut by the barbed wire once. None of the rest of them. I think they communicate things like that. There is a reason I like this truck so much and you see it here. It rained hard last night and it mostly soaked in but there is some standing water further down the ditch. Even with the nonaggressive tread this thing didn't slip at all. I got stuck with it the first time I took it into the field. I didn't know how to use it yet or even if the 4wd worked. I'm sure I will get stuck again somewhere but it will be different. I always heard that four wheel drive meant you could get further from help before you got stuck. We will see.The tractor will do the work but the 4X4 is much more versatile. 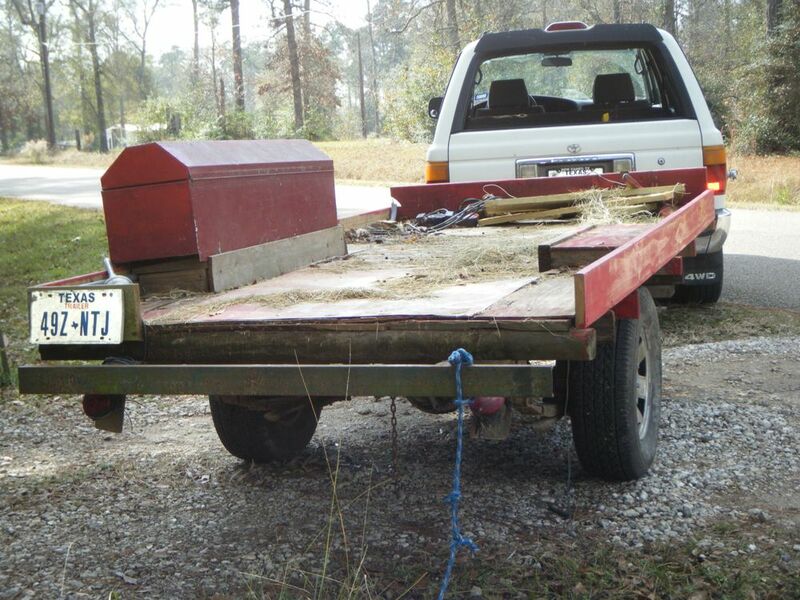 Trips to the feed store or taking the goat to the vet wouldn't have happened with the tractor. I considered a Crown Vic Police Car very long and hard. 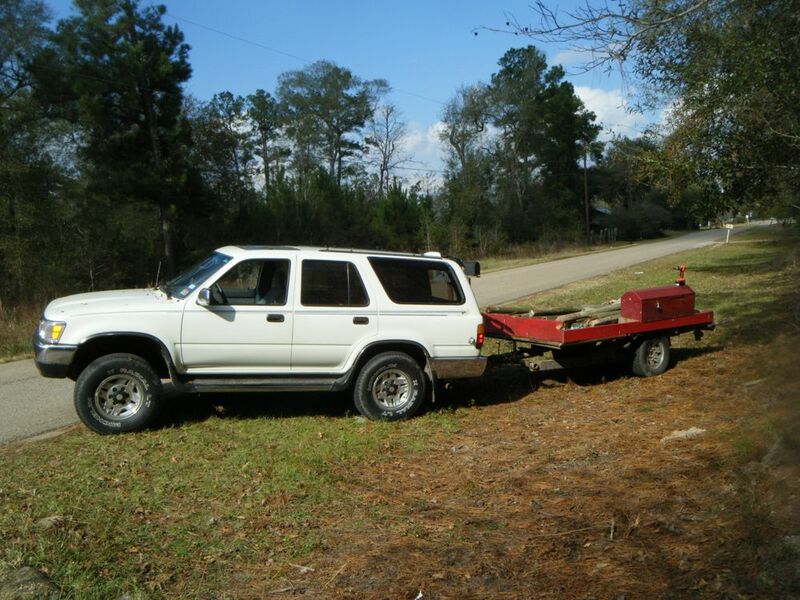 Might have pulled the trigger on that if it had four wheel drive but we made the right choice. It looks a lot better with the old fence down. There is a lot more to do but I will not be writing about it every day. I will add to the story when I add touches like the covers for the joints or making the pasture larger. For right now I'm happy with the way things are going. If it isn't your own project it can get boring rather quickly. Enjoy. Make it look nice she said. Ok, says I. That's a definite maybe.